RARE Football sticker issued by Holstein Pils under the Euro 96 Fun series, plain back. Measures approximately 4 x 3cm. 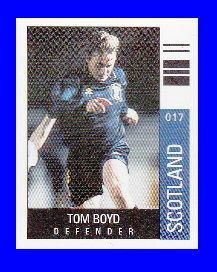 Depicting the Scotland star Tom Boyd, who played for Glasgow Celtic, Chelsea and Middlesbrough.